Cole rose to prominence in the late 1820s as America's first important landscape painter. By enriching his compositions with human activity that conveys messages of moral or historical import, he raised the status of landscape painting in this country above mere topographical rendering. Essentially self-taught, but well aware of the European landscape tradition, he first traveled to Europe in June 1829 to study the old masters firsthand. In contrast to the wildness of American scenery, which he painted in New York's Catskill Mountains, the overgrown ruins and ancient architecture of Italy spoke eloquently to him about the rise and fall of great civilizations. Of all the Italian cities Cole visited, Florence- where he spent several months in 1831 and 1832- was his favorite. 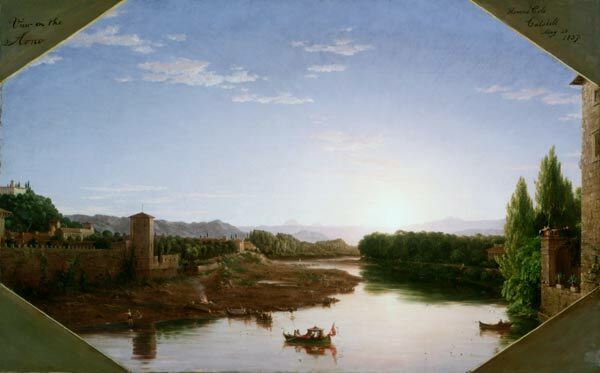 During subsequent years he composed several major oils from sketches he had made along the Arno River, including four versions of this view from the Florence house of the Bostonian Horace Gray. The present canvas, originally owned by Gray, shows the meanders of the Arno flanked by crenellated walls and towers, while fanciful figures carry on their daily activities. For Cole it was an idyllic vision celebrating the harmonious coexistence of man's cultural achievements and the glory of nature.